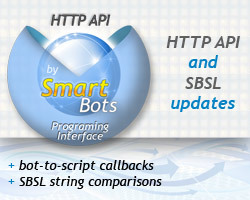 We’ve improved HTTP API of SmartBots and SBSL programmings language. SmartBots HTTP API now supports custom http callbacks: bot does a direct HTTP call to your website script (written in PHP, ASP, Perl or anything else) to inform you about in-world events (chat messages, group invitations etc). See set_http_callback API command for more information. Second improvement relates to SBSL and allows doing whole-word-only substring comparisons (for example, if you want to react on messages containing “ok”, but not “look”). See SBSL “if” command (“Whole word match only” section) for more details.